My bologna has a first name! It’s n-o-t-i-n! My bologna has a second name it’s my-m-o-u-t-h! No seriously. I don’t want that disgusting type of meat prepared for me anymore. Totally a grown up now and no longer need to bring a lunch to school. Hell, even when there were school lunches, none of them were comprised of bologna. If they did sneak it in there, they were damn tricky about it. As you can rightly tell, the review tonight is about the horrid bologna sandwich! Sure, it’s fine when you’re starving or when you’re a kid. But I’m sure that at least 90 percent of you reading this are not kids. Also, no. Being a kid at heart does not count. If it did, I’d be made of bologna. No wait. It wasn’t fine then either! Except for that old kid favorite, Lunchables. Those were pretty sweet. Not sure how that’s an exception since you could make them into a sandwich, but it wasn’t revolting. 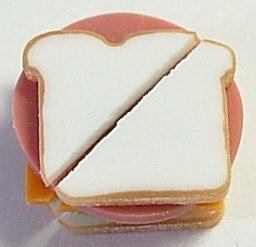 Bologna sandwiches for me are what veggies are for kids. Only to be consumed in extreme emergency. And lemmie tell ya, if it was the end of the world, I don’t think a bite of bologna is the worst of my problems. Don’t let the bread fool you, under all that wheat is a mistake against…meat-kind!! The Shu gives this a 2 explosion rating! This entry was posted on January 12, 2010, 10:47 am and is filed under Foods and Drinks. You can follow any responses to this entry through RSS 2.0. You can leave a response, or trackback from your own site. Just one question for the Hawaii dude. What about Spam? Isn’t that, like, at least as un-godly an abomination as bologna? In Hawaii, we have our own cookbook for spam! Radio talk shows about it! It’s served in our public school system, goes great with rice, is a common beloved breakfast and at some point, you’ll see someone wearing a shirt with spam on it! Spam is only un-godly in the mainland…unless you’re from the islands. Then it’s still good. Two words for that whole deal! Spam musubi. Also, they’re all up on Facebook I say! What…YOU DEFY BOLOGNA!!! YOU SHALL PAY FOR YOUR..ummm…DEFYINCE!!! But anywho…I can understand not liking the meat, but I have to say I enjoy it with a blob of ketchup. But this is coming for a human that still enjoys potted meat :D. But I will say I’ve been eating spam lately and liking it…but its still no potted meat sandwich with mustard.